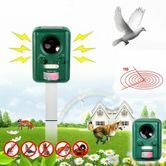 This Motion Activated Solar Power Pest Repeller is a great way to keep unwanted animals from destroying your garden. The moment the infrared sensor detects movement the device emits a high pitched frequency inaudible to humans but unpleasant for animals. Featuring a flashing light for animals that may get a little too close and an adjustable motion sensor range this animal repeller is great for camping, picnics or any other outdoor activity. This device can be charged purely with solar power but also comes with the option to charge its batteries with a USB line for cloudy days. This animal repellent is a safe, speedy, effortless and convenient way to keep animals at a distance without the use of toxic chemicals or traps! A strong ultrasonic signal frighten animals.